My ally in Spain was finally successful in taking Gibraltar from the British, closing the Mediterranean and lowering Britain's naval dominance score. 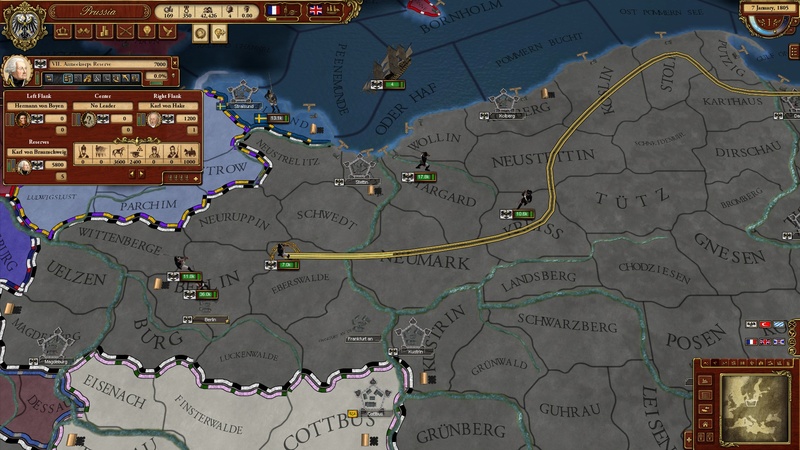 You see, March of the Eagles is the first Paradox grand strategy game you can win. Each nation has provinces it must control to increase its dominance score. 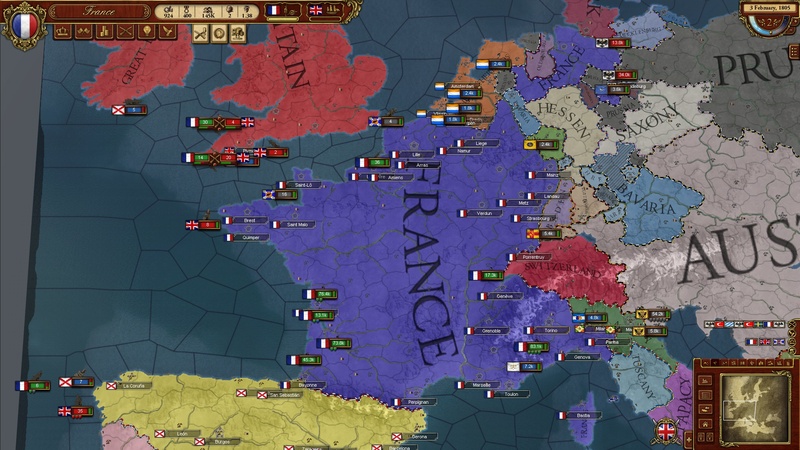 France starts the game as land dominant, while Britain enjoys a healthy naval dominance. 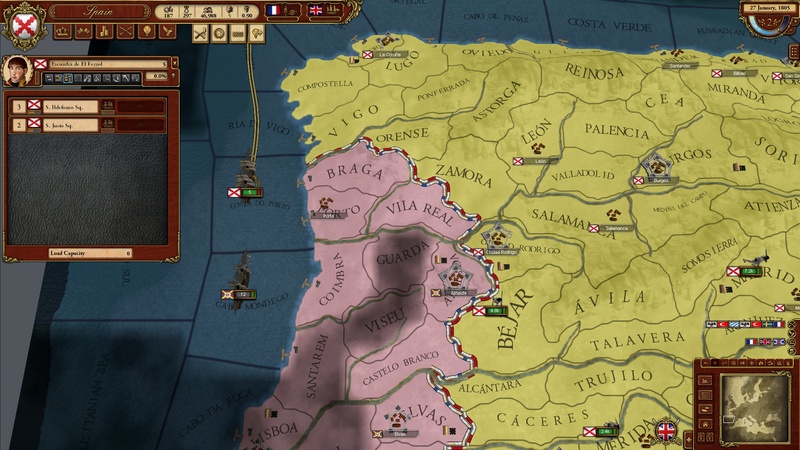 By taking Gibraltar, Spain reduced the number of provinces Britain held - Hooray for the Coalition of the Willing! - but that also pricked the ire of the British player. There followed a nasty campaign as the Limeys invaded the Iberian Peninsula and the Spanish valiantly marched to fight them off. 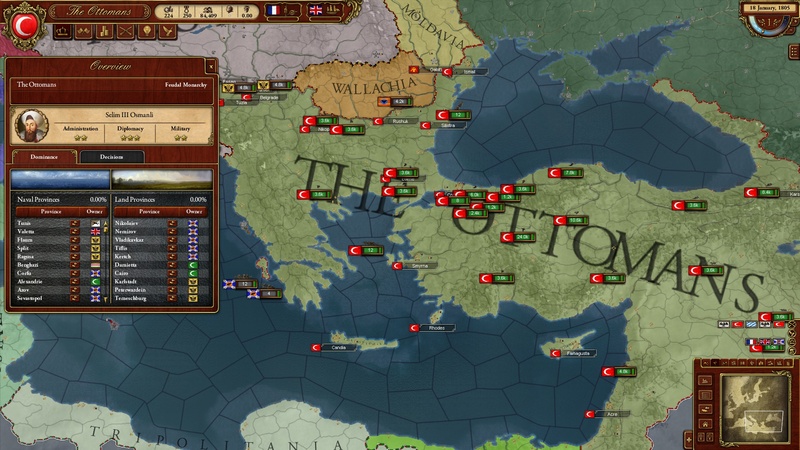 Whatever Naploeon's feeble navy could do to help was appreciated, I'm sure, but I couldn't send troops in time to help. 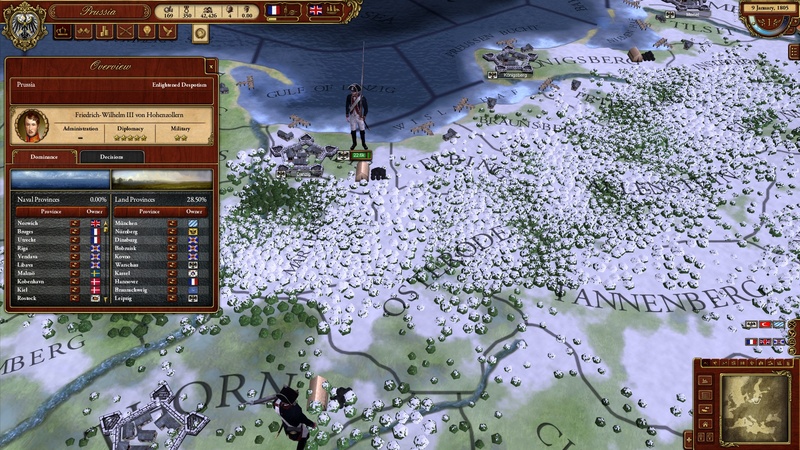 The distractions by Spain, the Russians and the Ottomans allowed Napoleon to retake many of the provinces lost to the Prussians and I even executed a successful campaign in Denmark to capture Hamburg and thereby increase my own naval dominance score. I sent envoys to the Austrians and the Prussians for a white peace, with no tribute demanded, but both the human leaders rebuffed my advances for peace on the continent. I guess the Germans wanted war after all. 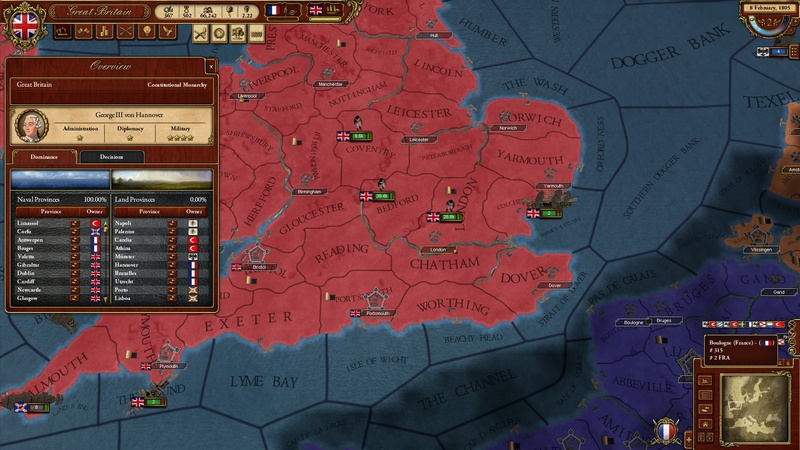 We were nearing the end of the session, so I made a last ditch play to send a small invasion force to the island of Ireland to take Dublin and Belfast, provinces needed for France's naval dominance. Here's where the interface slowed down my play again. I needed to have the correct number of forces loaded on to the transports, but it was difficult to click the right sequence of buttons and orders to make it happen. Chris King, lead designer of March of the Eagles, was watching over my shoulder as I fumbled around and he admitted it was a problem. "Our number one complaint has been to make it easier to load troops onto transports. We'll fix that before release," he promised me. 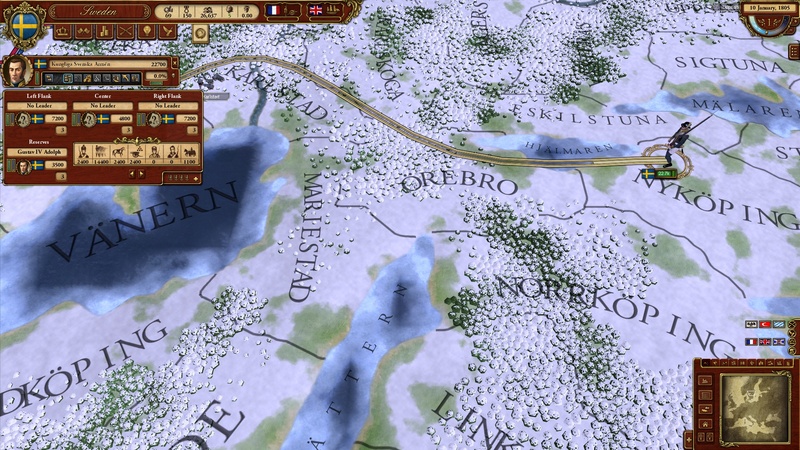 That release is coming in the next few months, and the timing is perfect for Paradox. 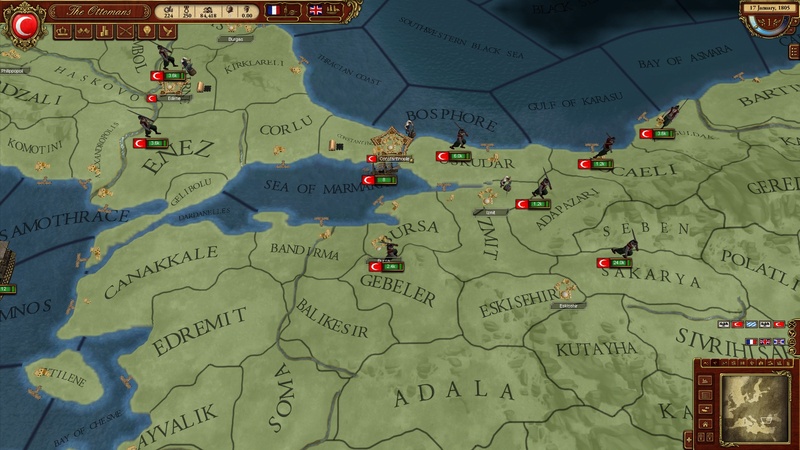 I heard it discussed many times at the event that Paradox considers March of the Eagles as "Grand Strategy Lite" or, in other words, an introduction to the upcoming Europa Universalis 4. 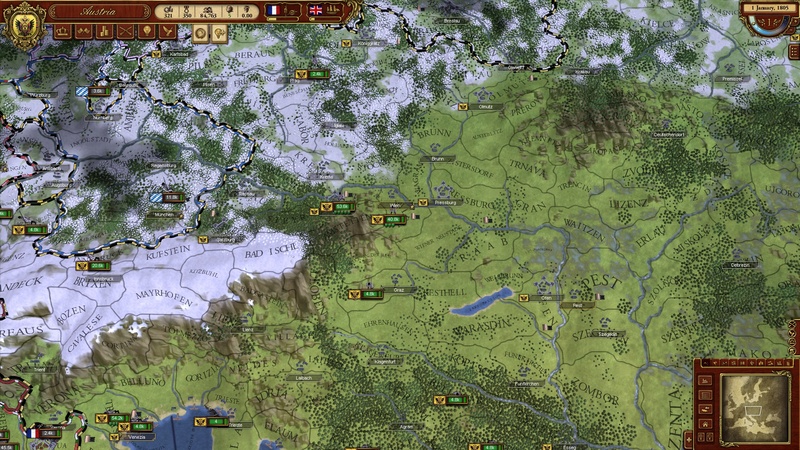 If the low price point of March of the Eagles gets some new fans on Steam - and the Napoleonic era might be enough to entice history buffs - then they will be primed to possibly be interested in the more complex affair of EU4. Me? I just barely took Dublin before our time was up, and in the final counting France was still on top of the rankings, just as she was to start the game. It was a Pyrrhic victory though. 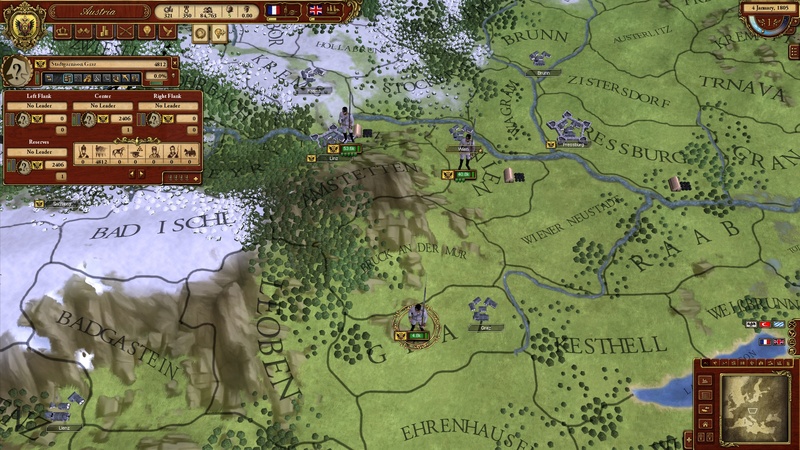 The wars I'd pursued with Prussia and Austria were costly and it will take years for France to recruit more young men to fill the ranks of the Grand Armee. Of course, days can zoom by at the click of a button in March of the Eagles ... it is only small matter of time before the continent is united under the might of Napoleon. Viva la France!